FILE PICTURE…….10.3.2013. 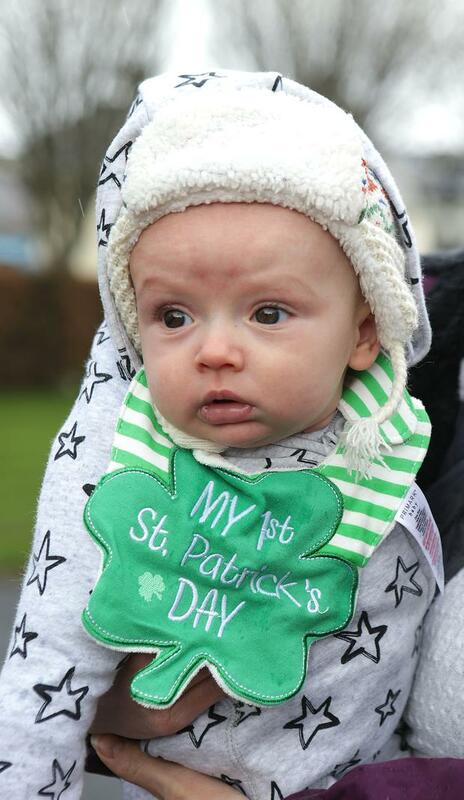 Oram is a tiny village in county Monaghan and is hoping this year to host Ireland's shortest St Patrick's Day Parade. The parade route is 55 metres long and will have at least 70 floates and vintage tractors. Oram residents Lisa Murphy and king of country music Big Tom are super excited about this years parade. Picture Ciara Wilkinson. 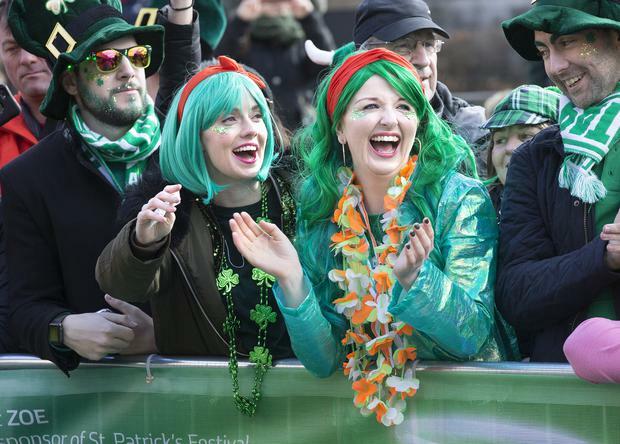 THE THREAT of showers and shiver-inducing temperatures failed to deter large crowds from 'wearing the green' at more than 150 St Patrick's Day parades across Ireland. From Ireland's earliest St Patrick's Day parade in Dingle to Ireland's only parade where a rescued horse was the star of the show in Kinsale, huge crowds gathered to celebrate Irish history and culture. An estimated two million people attended parade's and St Patrick's festivals nationwide. 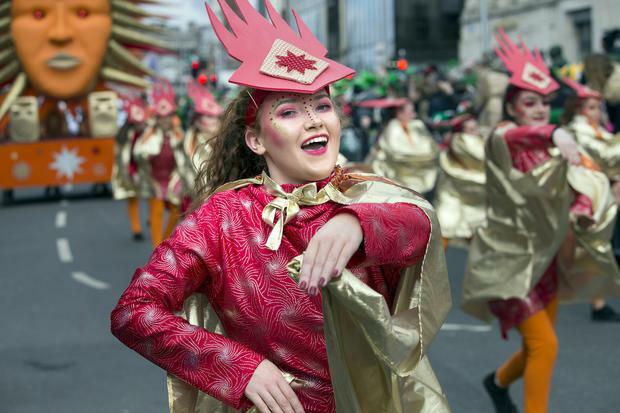 Festivities at Ireland's largest parade in Dublin kicked off after midday, with thousands lining the streets of the city centre. 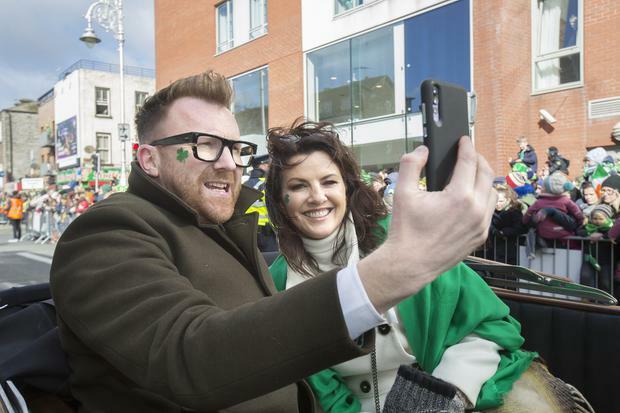 Grand Marshal duo Jason Byrne and Deirdre O'Kane kept crowds laughing despite a windy start to the day. Lord Mayor of Dublin Nial Ring also received a great reception from revellers, who came in flocks from Ireland and abroad. "Once again Dublin had a fantastic St. Patrick’s Day Parade. Great crowd, great atmosphere, great bands and pageants. It was amazing to see so many people out enjoying the spectacle," Mr Ring said. "A rich part of our history, culture and heritage, the St. Patrick’s Day Parade is simply just part of what we are and part of what we do best – celebrate. "From sitting on my Dad’s shoulders to standing on a ladder to watch the Parade I have many fond memories of it. This year I was able to go in the Lord Mayor’s coach and review the Festival Parade from outside the historic GPO. Still pinching myself!" A family beginning a new story in Dublin, the Chhikara’s from New Delhi, India, marvelled at the party atmosphere at the parade. Father Arun Chhikara, 34, wife Anjali, 34, and children, Kanishihk, 7 and Kiara, 3, have recently moved from their homeland to Clarehall in the north of the city and they’re already soaking up the Irish culture. “I moved to Ireland to work as a project manager but that’s not the main reason we moved here,” Mr Chhikara said. The parade marked a special family event for Dubliners, Michelle Green, 32, husband, Terry, 39, and children, Sean Anthony, 11, Sienna, 7, and Louis, 5. The family from Donabate, north Dublin, were enjoying the parade as a treat which is especially vital for Louis, who has Worster-Drought syndrome, a form of cerebral palsy. Jill Behnke, 36, husband Bob, 38, daughter, Ryleigh Barratt, 18, and son Colton, 2, had only just arrived in Dublin at 4am after a flight from Chicago but despite getting no sleep, the family hit the streets for the parade. He added that attended the parade was “another part of us learning about Ireland’s culture”. Dublin Fire Brigade's mascot Cú the Irish Wolfhound was a hit among parade-goers, but unfortunately picked up a paw injury during the parade and had to make an early exit. The theme of the parade this year was storytelling- Scéalaíocht agus Seanchaí- which was evident through the colorful costumes and performances from all the groups taking part. Marching bands from Ireland and across the world enthralled the audience with familiar tunes, with bands coming from Pennsylvania, Wisconsin, Texas, California and Germany. The Forests of Fado float showcased children dressed as flowers and trees coming to life while Charlotte Catholic high school marching band from North Carolina entertained the crowds, along with the University of Iowa Marching Band. 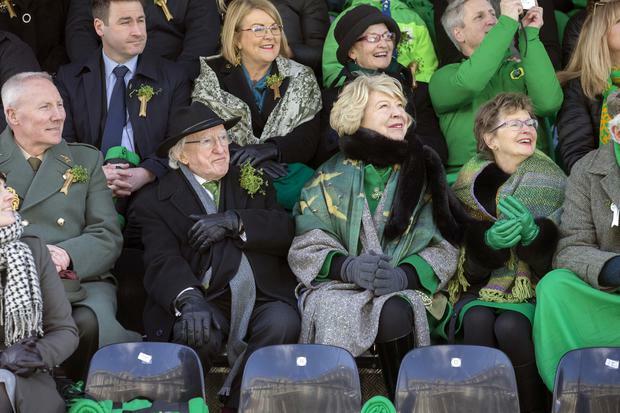 President Michael D Higgins and his wife Sabina were spotted watching the spectacle from the Grandstand at the GPO. The couple attended a service of remembrance at St Mary's Pro Cathedral for victims of the New Zealand attack before making their way to the parade. Speaking about the Festival Parade this year, CEO of St. Patrick’s Festival, Susan Kirby said; “the calibre of pageants and marching bands at the Parade each year is superb, and this year it was spectacular. "The Parade is a wonderful and proud reflection of the abundance of artistic talent that we have here in Ireland and also an incredible global showcase of our rich culture and heritage as the Parade is streamed live internationally. Cork again boasted the largest parade outside Dublin where former Olympian and world champion race walker Rob Heffernan was the grand marshal. "It's a huge honour - I'm absolutely thrilled," the athlete admitted. The former world champion was cheered on as he led the parade by his wife, Marian, and four children, Tara, Reagan, Cathal and Meghan. 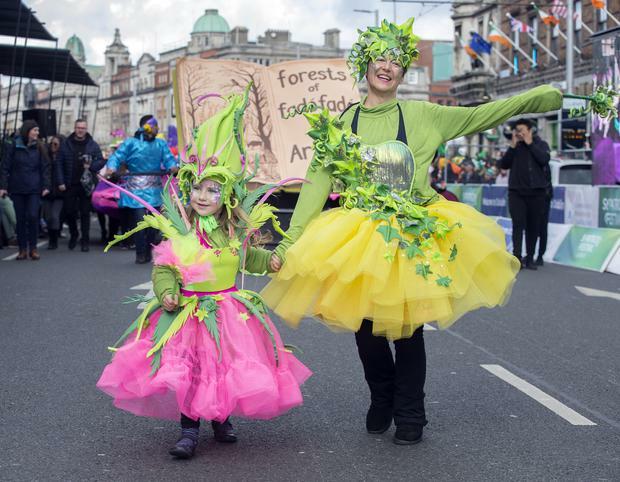 More than 2,000 community groups and floats took part in the Cork parade which was again boosted by a special St Patrick's Day festival complete with Irish artisan food village. An estimated 100,000 people attended the Cork parade and festival which was further boosted by the official debut of the city's newly refurbished St Patrick's Bridge. The parade featured numerous US marching bands including the Mandan Braves from North Dakota, the Arvada West High School Band from Colorado, the Knights of Columbus Pipe Band from New York and the Columbus East High School Band from Indiana. However, the popular tourist town of Kinsale threatened to steal Cork's thunder thanks to the viral sensation, Paddy the Horse. Paddy was rescued by Kinsale RNLI just minutes before he seemed certain to drown on February 17 - and footage of his rescue earned headlines worldwide. The lucky horse yesterday proudly lead the St Patrick's Day marchers in Kinsale. Paddy was being washed down by his owner, Paul Crowley, in the Bandon River when his hoof became wedged in a submerged oyster bed. With the tide rising fast, Paddy faced certain drowning. However, RNLI volunteers Jonathan Connor and Michael O'Sullivan defied the cold and conditions to enter the water and successfully free Paddy. "We asked Paddy straight up did he want to take part in the local parade - yay or nay," Jonathan joked. "He didn't neigh so we took it as a yes." Glounthaune featured Ireland's shortest St Patrick's Day parade while Fermoy boasted Irish rugby hero Mike Ross as the grand marshal. It was a proud homecoming for the rugby star as he attended St Colman's College and started his career with Fermoy RFC. The first St Patrick's Day parade on Sunday was once again in Kerry. Dingle kicked-off the celebrations to honour Ireland's national saint at 5.45am with the Dingle Pipe and Drum Band leading marchers through the town. In Killarney, an estimated 10,000 people took part in the parade which, as is traditional, boasted a very strong American participation and this year featured a circus-theme with 'The Greatest Show'. Tralee's parade boasted not one but two grand marshals - Ryan Kelliher (8) and Rose of Tralee boss Anthony O'Gara. Ryan was specially honoured for his brave battle against muscular dystrophy. In Tipperary, the Clonmel parade had St Vincent de Paul President Kieran Stafford as grand marshal and featured the unveiling of a special plaque to commemorate the four Premier County participants in the first Dáil, 100 years ago. 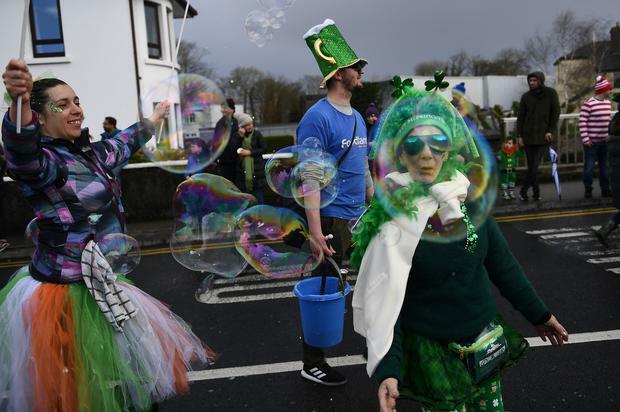 In Galway, more than 30,000 people celebrated the St Patrick's Day festival with the city set to proudly serve next year as European Capital of Culture. Boasting a new parade route, Galway's 117th parade had the theme 'Diversity' with the marchers proudly fronted by the Young Ensemble from local theatre group, Macnas. In Limerick, the St Patrick's Day parade had University of Limerick graduate and the woman who hopes to be Ireland's first astronaut, Dr Norah Patten, proudly serve as its grand marshal. The parade was again boosted by participants attending the local 49th International Band Championships. More than 1,300 participants will take part in the prestigious Limerick competition which begins on Monday. Waterford's parade again honoured the fact that the entire St Patrick's Day celebration was the brainchild of local man Luke Wadding. He came up with the idea in the 17th Century that St Patrick should be honoured with a special Church holiday in Ireland. Local couple, Des (84) and Mona (83) Monahan served as the Waterford parade grand marshals. The honour was bestowed in recognition of how their remarkable love story went viral worldwide and earned them TV appearances across Ireland, the UK and US.